Recipes can be rather imprecise: a dab of butter, a pinch of salt. But Johns Hopkins engineering students recently learned that maintaining rigid control of cooking temperatures, with less than 1 degree of wiggle-room, can lead to much tastier meals. Oddly enough, their cooking experiments occurred in an undergraduate course called Robot Sensors and Actuators. Class instructor Noah Cowan, an associate professor of mechanical engineering, assigned his students to tinker with common cooking appliances such as toaster ovens or water heating tools. Their revamped appliance had to operate under the control of sensors, actuators and a microprocessor, programmed by the students. The goal was to devise a system that could sense the temperature of the cooking medium, trigger steps to get the air or water to a particular level of heat—and keep it there. The system had to work like the familiar thermostat that regulates a home’s heating and air conditioning, but with much greater precision. Because Cowan himself likes to cook, he decided to mix this high-tech task with some lessons about Sous Vide, an increasingly popular way of preparing food. In the Sous Vide method, the food is vacuum-sealed in a bag and immersed in hot water to cook at a relatively low, but constant temperature, generally for a longer period than in traditional cooking. Proponents say this method produces meats, poultry, fish and vegetables that are more evenly cooked and boast superior flavor and texture. To allow his students to learn more about this technique and about molecular gastronomy (the science of cooking), Cowan arranged for his class to visit the Waterfront Kitchen in Baltimore, where Chef Jerry Pellegrino shared insights. For the course’s final project, the 64 students divided into 22 teams and built their own cooking systems. The results were unveiled at a class gathering that was part device-testing time and part potluck sampling session. A few students showed how to use modified toaster ovens to produce veggie pizzas and “perfect toast.” One team devised an egg-cooking system with a basket that immersed its cargo when the water reached the right temperature and lifted it out when the cooking was complete. 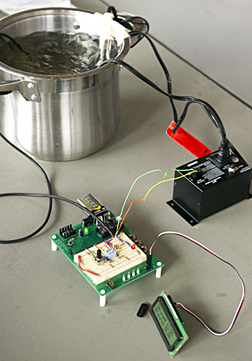 But most projects pursued the Sous Vide option, using sensors and other electronic components to control heaters that maintain a steady cooking temperature in a pot of water. This method yielded Chinese dumplings, sweet potato fries, a dessert called Strawberry Champagne, cinnamon apples, shrimp, chocolate malted milk custard for ice cream and some fondue made from melted chocolate chips. 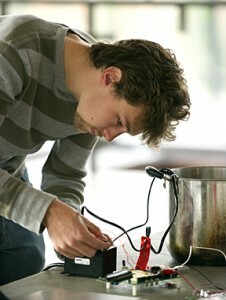 Many students praised the Sous Vide approach. “If you keep it at an even temperature, you never have to worry about overcooking,” said Steven Lin, a mechanical engineering major who was part of the Strawberry Champagne team. Still, the key purpose of the course was to teach the students how to build and use the “smart controller” that kept the cooking temperature constant. Course instructor Cowan pointed out that these controllers are widely used beyond the kitchen in many industrial applications. In the weeks leading up to the device demonstrations, some students discovered that assembling and “tuning” their sensors, actuator and microprocessors was a challenging task. Online video and digital photos available; contact Phil Sneiderman.